All six rails swing open by pulling a pin, making the horse more accessible for tasks such as suturing or for emergency evacuation. The deck is made of 3/16 plate reinforced with cross-members. It is covered by a rubber mat which is bolted to the deck, to ensure footing. After thirty years of designing, I offer stocks that are built with function and safety in mind. 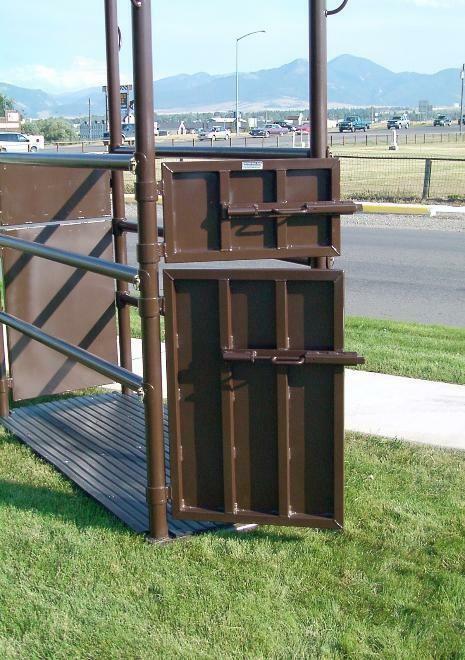 Originally built for veterinarians, horse stocks are a must-have for the serious horse operation - from one horse to one hundred. Robertson Horse Stocks weigh approximately 950 pounds. 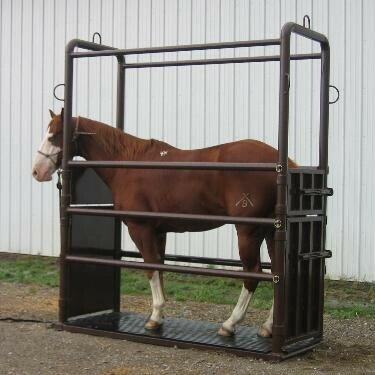 They are sturdy, built for the safety of both horse and handler, and make tasks such as worming, Artificial Insemination, and doctoring easier. All four doors have piston, spring-loaded latches for fast closing. 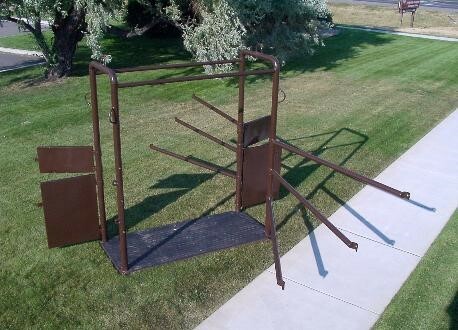 A front end loader can be used to move stocks, for portability, or four mounting brackets on corners allow it to be mounted to floor, if desired. Dental Bars are also available. Subject to change with cost of steel. Call for quote.